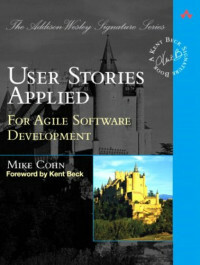 Thoroughly reviewed and eagerly anticipated by the agile community, User Stories Applied offers a requirements process that saves time, eliminates rework, and leads directly to better software. The best way to build software that meets users' needs is to begin with "user stories": simple, clear, brief descriptions of functionality that will be valuable to real users. In User Stories Applied, Mike Cohn provides you with a front-to-back blueprint for writing these user stories and weaving them into your development lifecycle. You'll learn what makes a great user story, and what makes a bad one. You'll discover practical ways to gather user stories, even when you can't speak with your users. Then, once you've compiled your user stories, Cohn shows how to organize them, prioritize them, and use them for planning, management, and testing. Working with managers, trainers, salespeople and other "proxies"
User Stories Applied will be invaluable to every software developer, tester, analyst, and manager working with any agile method: XP, Scrum... or even your own home-grown approach. This is an invaluable five-volume reference on the very broad and highly significant subject of computer aided and integrated manufacturing systems. It is a set of distinctly titled and well-harmonized volumes by leading experts on the international scene. Since its inception in 1991, EUROMAT has been held each year on behalf of the Federation of European Materials Societies (FEMS), and alternates between general and topical prospectives.